Our residential 'Larkspur' project is nearing completion and we wanted to share a few photos of it's progress. Built on a large corner lot in a neighborhood with a prescriptive ranch-style height limit, the courtyard-based floor plan allows this family with active kids to be engaged with the outdoors. The predominant contrasting light and dark aesthetic of the exterior white stained shake siding and steel runs into the interior material palette throughout. Below, one of two concrete frogs found during demo and excavation of the site sits watch over the site. Posted there during the entirety of construction, we've come to think of them as our guardian spirit frogs. This last week brought exciting updates as the massive steel bent is lifted up and over into place at Calcaire to begin the formation of the gable end at the main entry. Only one more steel delivery until we can finish roofing the entire structure and really begin to visualize the scale and height of these grand gable spaces. More more progress posts of Calcaire, click into the "Calcaire" tag below the post. If you remember our first blog post and introduction of Animal House, a home for "horses, alpacas, goats, ghosts, and goblins," you'll recall we promised an update on the roof thatching process. Scroll down for more photos and tidbits when we dropped by to watch this fascinating process. Securing the thatch down... each successive bundle will conceal the wire. We introduced the ground breaking of our residential project Calcaire on the blog back in November along with renderings and videos of the fascinating process of relocating behemoth trees. We're on site this week with framing updates and the anticipation of all of our steel arriving on three trucks over the course of March. The lack of framing sure is deceiving ...the remainder of the house envelope is glass and steel! What a stunning day for a site visit at our Geneva Park project. We introduced this project back in early January here and oh myy is it sprouting up beautifully in such a serene location. We've broken ground (and then some) on our Geneva Park residence in Boulder. Inspired by the humble little white farmhouse in the woods, we can't wait to frame out this amazing landscape dotted with Silver Maples, Spruce, and spectacular views. The walnut trunk is now up at 'Animal House'! Towering 15' high, the tree supports the church-like "apse" punctuating the end of a linear series of stalls/party pads for various animals. Originating from the site, the black walnut's bark was scraped off and teak oil was used to enrich the surface. Affectionately dubbed 'The Witches Hut', the apse will also house a massive stone fireplace where humans, horses, alpacas, goats, ghosts, and goblins alike will enjoy the grand space. Check back in December for an update on the roof thatching process! We're breaking ground on a new residential project in Boulder and our builder sent us some amazing aerial shots of excavation. Scroll down for the time-lapse video of when trees sprout legs and settle down for a better view. For more glimpses of this project, check out Calcaire on our main site. Breaking Ground in Cherry Creek! Situated in the heart of Denver’s Cherry Creek Neighborhood; this modern home redefines the limits of conventional living. As a response to the surrounding urban environment, and adjacent Ross Cherry Creek Public Library, the project required a unique siting and massing approach to create a private courtyard retreat. The open floor plan is perfect for entertaining and family events as the interior gathering spaces and courtyard are united through four glass garage doors and large expanses of glazing. 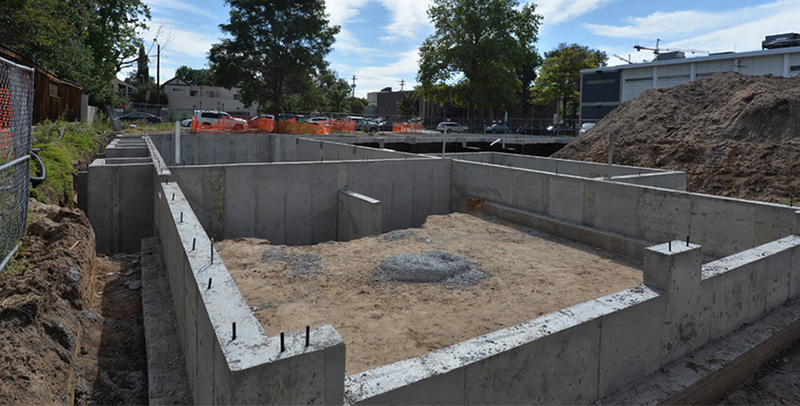 As construction continues, the advanced geothermal system is being installed; which will serve to both heat and cool the residence. We are looking forward to this project materializing to reveal the soaring wood beams and exposed steel structure, further adding to the unique fabric of the cherry creek neighborhood. 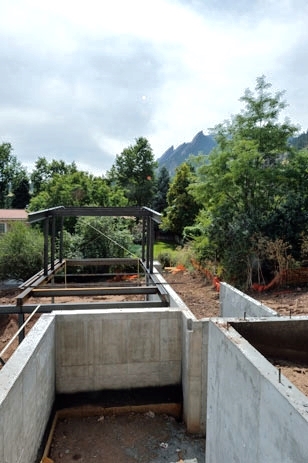 Currently under construction, nestled into the base of the Flatirons, is a house unlike any other. A challenging, steep site, led to a design that is both built into the hillside, and floating above. Two large cantilevers, one on each level, are easy to see now that the steel frame has been erected. The frame will continue to be exposed as an internal architectural feature of the house, with the frame walls built around it. The finished house will capture views of the Flatirons to the south, Flagstaff Road to the west and over Boulder to the east through large expanses of glass. Concrete retaining walls will enclose a private landscaped courtyard, a well-manicured piece within the natural site. Under construction for several months now, the new headquarters for Anthem Branding is beginning to resemble a finished building. The three story steel, glass and CMU structure occupies a front row space on Broadway in central Boulder. Situated across from the lively Community Plaza, the location is an ideal home for young, creative energy which fills the ranks at Anthem Branding. With expansive glass facades the views from within are inspiring and the design reflects Anthem Branding’s desire to compose a work space which speaks to their creativity. A spring completion date couldn’t be more fitting for this growing company to seed down in their new digs!